During this campaign, I’ve been talking a lot about what I see as the central economic challenge of our time: raising incomes so hardworking families can afford a middle-class life. I believe one of the single biggest ways we can raise incomes is by making college affordable and available to every American. So today, I’m laying out a plan to do just that. 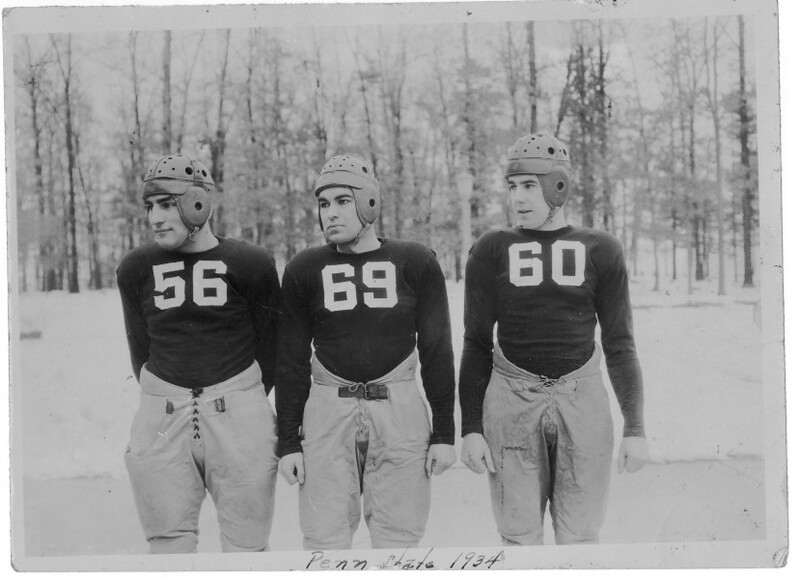 Hillary’s dad Hugh, center, at Penn State. 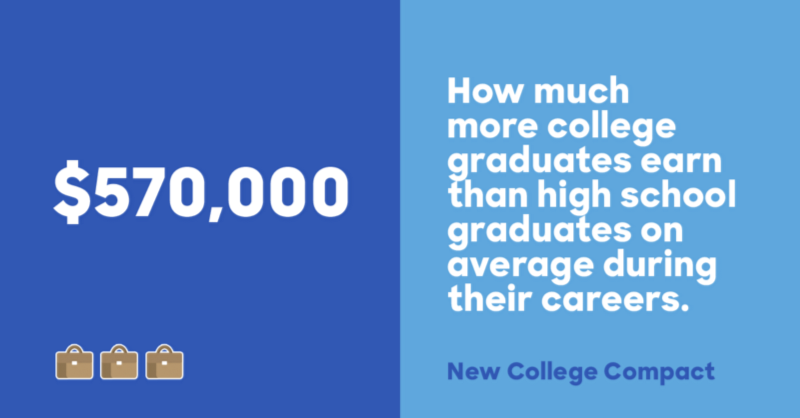 For millions of Americans, a college degree has been the ticket to a better life. My grandfather worked his entire life in a lace mill, but my dad made it to college. He was able to start his own small business, and that made a huge difference in our lives. Then my parents saved for years so they could send me to a school across the country. They knew that they were setting me on the path to a better future. College still holds that promise. A lot has changed in this country — but that hasn’t. Parents who never had the chance to go to college themselves dream of seeing their kids get that degree, from the moment they’re born. High-schoolers — even middle-schoolers — are taking college prep courses and studying for the SAT. Full-time workers are taking courses online, even if that means heading straight from an eight-hour shift to a pile of homework. If that’s what it takes to get a better job — to give their kids better than they had — then they’ll do it. But here’s the problem. States are slashing education budgets. Colleges keep raising prices. In-state tuition and fees for public colleges increased by 42 percent between 2004 and 2014. But incomes didn’t rise by that much. So families are left facing a painful choice. Either they say, “We just can’t afford it,” and pass up on all the opportunities that a degree offers — or they do whatever it takes to pay for it, even if that means going deeply into debt. Now, for most people, the return on investment of a college degree is still worth it. On average, people with four-year degrees earn over half a million dollars more over their careers than people with high school degrees. But student debt is increasingly holding people back. Forty million Americans have student loans. Together, they owe more than a trillion dollars. And millions of Americans are delinquent or in default. Even if they do everything they can to pay their loans, they just can’t keep up. The cost of this debt is real — not just on balance sheets, but in people’s lives and futures. I’ve talked to people who have so much student debt, they’ve put off buying a house, changing jobs, starting a business — even getting married. I’ve met parents and grandparents who’ve co-signed loans and end up draining their savings or ruining their credit — all because they did what parents and grandparents are supposed to do: help out the next generation. There are students who take out loans to pay for an expensive degree from a for-profit institution — only to find little support once they actually enroll, or they graduate and discover that, when it comes to finding a job, their degree isn’t worth what they thought. Then there are the students who start college but never finish. They’re left with debt and no degree to show for it — the worst of both worlds. Over 40 percent of college students still haven’t graduated after six years — and many never do. It’s time to show some tough love to colleges and universities that let significant numbers of students fall behind and drop out, year after year. Here’s the bottom line: College is supposed to help people achieve their dreams. But more and more, paying for college is actually pushing people’s dreams further out of reach. And that’s just wrong. It’s a betrayal of everything college is supposed to represent — and everything families have worked so hard to achieve. This is also about America creating the greatest workforce in the world in this century — just like we did in the last. The rest of the world is working as hard as they can to out-do us. China plans to double the number of students enrolled in college by 2030, which means they’ll have nearly 200 million college graduates. That’s more than our entire workforce. American workers can out-work and out-innovate anyone in the world. They deserve training and education that will help them do it. So we need to make some big changes. We need to transform how much higher education costs — and how those costs get paid. For too long, families have been left to bear the burden of crushing costs, underinvestment, and too little accountability. It’s time for a new college compact, where everyone does their part. We need to make a quality education affordable and available to everyone willing to work for it — without saddling them with decades of debt. I’ve been traveling the country for months, talking to students and families, educators, legislators, and experts of every stripe — including young progressive activists who’ve put the issue of debt-free college and affordability at the top of the national agenda. Under the New College Compact, no student should have to borrow to pay tuition at a public college. Schools will have to control their costs and show more accountability to their students. States will have to meet their obligation to invest in higher education. The federal government will increase its investment in education, and won’t profit off student loans. 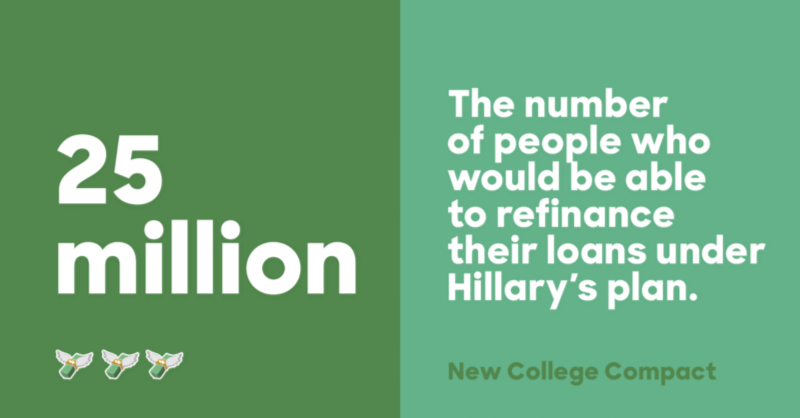 And millions with student debt will be able to refinance it at lower rates. That’s my plan. It’s ambitious — and we should be ambitious. But it’s also achievable. And it would make a big difference in people’s lives. The New College Compact comes down to two big goals. First, we’ll make sure that cost won’t be a barrier. Under my plan, tuition will be affordable for every family. Students should never have to take out a loan to pay for tuition at their state’s public university. We’ll make sure the federal government and the states step up to help pay the cost, so the burden doesn’t fall on families alone. Of course, these days, tuition isn’t enough. The cost of living at college has also been creeping up. So under my plan, students who qualify for Pell Grants will be able to use them for living expenses — and middle-class students will get more help to cover their living expenses, too. We’re also going to make community college free. That’s President Obama’s plan and we’re making it ours. If students start at a community college and transfer to a four-year school, we’ll make sure their credits count and their transition is seamless. 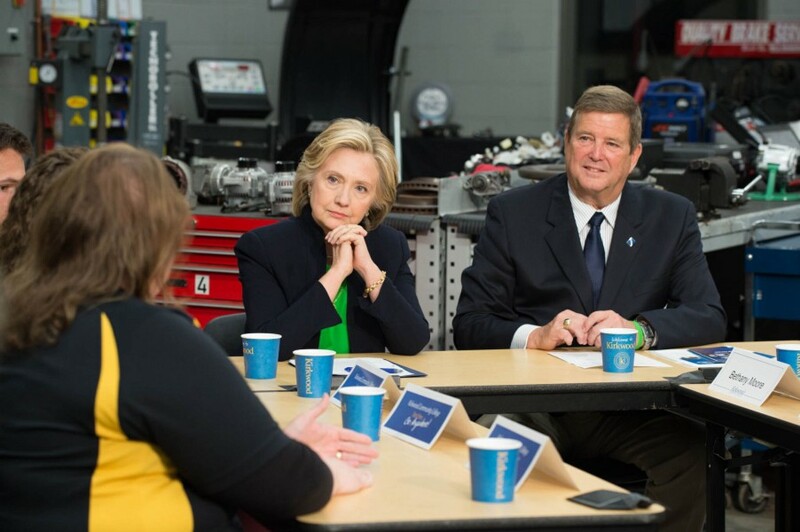 And we want more community colleges to offer two-year degrees and certificate programs that are valued by employers — so students know that, if they do the work, they’re in good shape to get a good job. 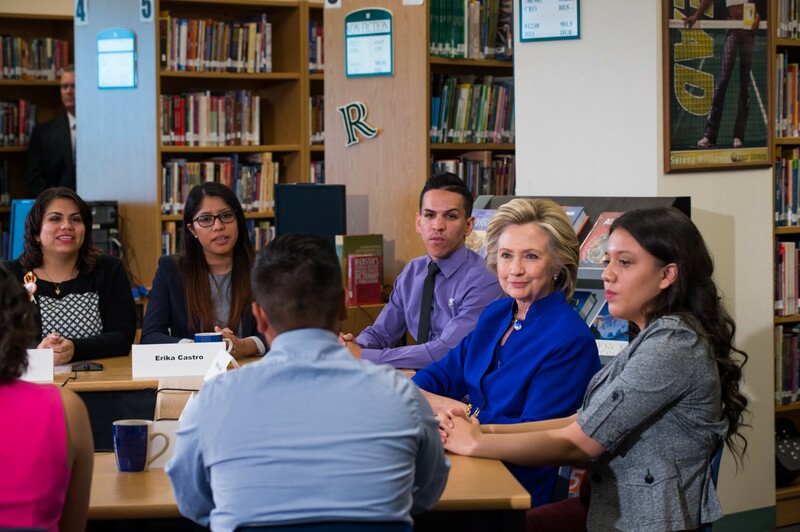 We’re going to work closely with Historically Black Colleges and Universities and Hispanic-Serving Institutions, because they serve some of America’s brightest students, who need the most support and too often have gotten the least of it. We’ll offer special help to college students who are parents, because when you help parents get an education, you’re helping their kids, too. And we’ll make a promise to students who perform national service. We are providing the best ways to find tutoring jobs to teach America’s kids or cleaning up our parks or helping communities hit by disasters, we’ll guarantee that you can attend your public university or college debt-free. So that’s the first big goal. Here’s the second: We’ll make sure that debt won’t hold anyone back. For the millions of Americans who already have student debt, my plan will give you the chance to refinance at lower interest rates. If you can refinance your mortgage or your car loan, you should be able to refinance your student loan. It’s just wrong that people are locked into college loans at 8, 9, even 10 percent. If you do end up taking out a loan — for example, to go to a private college — we’ll cut your interest rates, so the government never makes a profit off your loan. We’ll make it easier to enroll in income-based repayment programs, so you’ll never have to pay more than 10 percent of what you make — and your debt will only last for a fixed period of time. It won’t hang over your head forever. We’re going to help borrowers who are in default get back on their feet. We’re going to make sure colleges and universities have more skin in the game. If they load students up with debt for programs that don’t lead to good-paying jobs, it shouldn’t just be the students and taxpayers left holding the bag. Colleges deserve some of the responsibility, too. And we’ll crack down on predatory schools, lenders and bill collectors. If you defraud students, overcharge veterans, or mislead borrowers, we’re going to do everything we can to stop you. 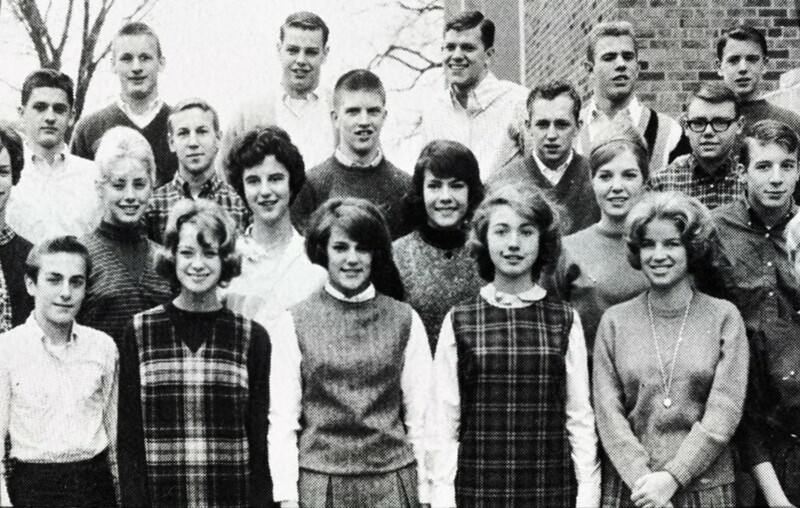 There’s a lot more in my New College Compact — from strengthening the G.I. Bill, so more veterans can get their degree, to making sure that colleges spend federal dollars on things that benefit students, like teaching and research — not marketing campaigns or big salaries for administrators. And we’re going to do a lot to encourage innovation. Here’s one example. Workers are increasingly rebooting their careers through online programs — yet many students can’t use federal student aid to pay for them. If earning online badges, specializations, or nano-degrees helps people improve their job prospects, we should be making that option easier and more affordable. Under my plan, more students will be allowed to use student aid to pay for high-quality programs. And we’ll make sure that rules about accreditation don’t keep out promising online education companies. We want to keep quality high — without stifling innovation. Now, the reason I call this a College Compact is because it goes both ways. Everyone’s going to have to step up to the plate. We can’t fix the problem of rising costs and rising debt just by throwing more money at the problem. We can’t expect the federal government to just pay the bill for free. That’s not how America works. States will have to start investing in education again. Colleges will have to do better by their students. And Americans will have to work hard to put themselves through school, and to out-learn and out-hustle our competitors — just like we always have. An education shouldn’t be something just for those at the top. And it shouldn’t be a burden. An education should be affordable — and available — to everyone. I remember how proud my parents were when I graduated college. I remember how proud Bill and I were to see Chelsea graduate — I’ll never forget how grown-up she looked that day. And even though my new granddaughter is already growing up faster than I’d like, I can’t wait to see her walk across a stage someday and receive her diploma. 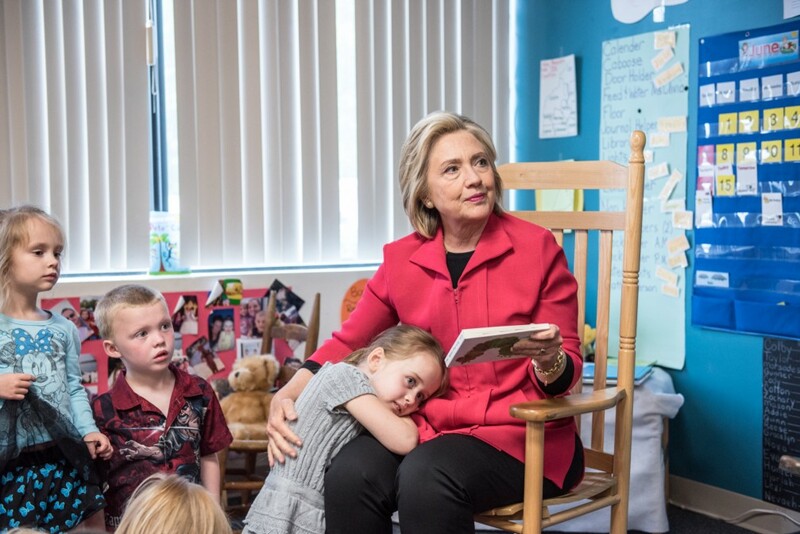 And I know that mothers and fathers and grandparents across the country feel the exact same way. I want every young person in America to have their shot at that moment. I want every hard-working parent out there to get the chance to see his or her child cross a stage — or to cross it themselves. America should be a place where those achievements are possible for anyone who’s willing to work hard to do their part. That’s the country I want to help build — for this generation and all the generations to come. 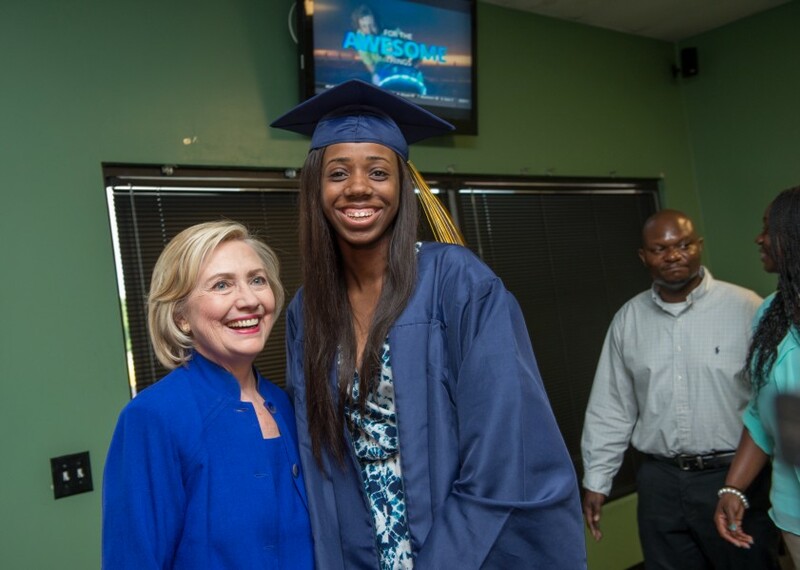 Stand with Hillary for the New College Compact — add your name. There is no way I can remember the details or put her plans into a simple short phrase to explain it. I will leave it to the experts to go over the details but as you said Still, “she has a plan for that” and that is enough for me. Her economic plan especially. I still sum it up by saying “she wants to stop short-termism and other things… but I am not an economist – um, look it up”. Most people don’t ask about issues anyway. Thankfully. Lots of parts to it all. Can you tell me the name of the plugin you use for that little Like star for comments? I don’t know the plugin. It is just an option wordpress made available.